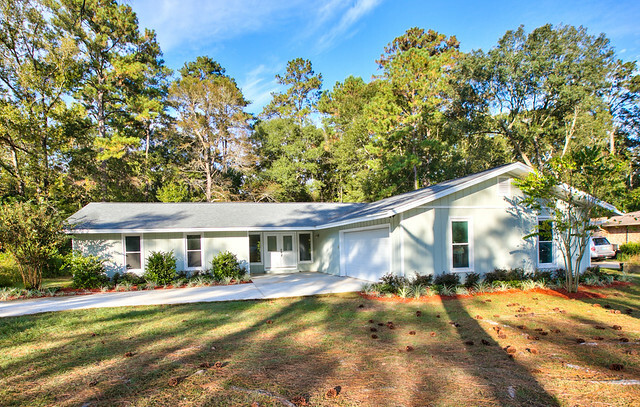 Remodeled Betton Hills Beauty over 1900 square feet! You will fall in love with the "Open Floor Plan" renovated home. This builder spared no cost, started with wall demolition and renovated from roof to subfloors and windows to outdoor spaces. With remodeled IKEA kitchen cabinets, Thick granite counter-tops and bar area, stainless steel appliances, re-tiled and expanded baths with granite counter-tops, modern fixtures and elongated tile flooring, had scraped walnut wood floors, stacked stone fireplace, newly configured enclosed laundry room, new roof, new rear deck, new HVAC unit (heating and air), re-poured driveway and interior and exterior paint! Whew! This home is literally...New! Located conveniently close to Centerville Rd. and Thomasville Rd, you will be minutes away from anything and everything Tallahassee. And let's not forget that huge back yard..if you are a BBQ fan, or simply want the kids or pets to have some space to play and create memories, this is the home for you. Browse the slideshow below for photos of this beautiful listing.